Create lasting memories and give a gift that will be treasured for a lifetime. 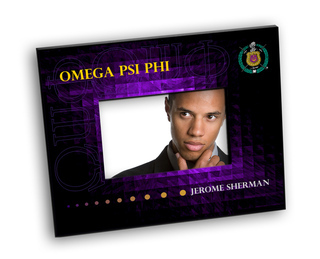 Our sorority and fraternity picture frames take a special photo of your brothers and sisters and turn it into a priceless keepsake. We have wooden picture frames that you can personalize with top and bottom inscriptions. 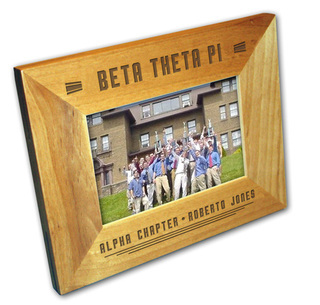 We also have pre-designed fraternity frames for your particular group that includes the name, founding date, motto and other pertinent information. Our brushed crest picture frames are elegant enough for a corporate office. They're made from rosewood colored wood and brushed silver metal, with our high-tech laser engraving. You choose the sorority or fraternity and add your custom bottom text. This same frame is also available with the group's name engraved boldly across the top in place of the crest. 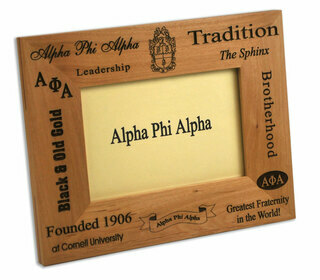 We also offer rosewood colored and black colored wood frames that are 8 inches by 10 inches. These can be used to display a photograph or a certificate, and they're engraved on the bottom with your group's name. Our silver plated Greek picture frame is elegantly engraved with your sorority or fraternity crest and letters for a beautiful presentation, making this a classy, sophisticated gift. 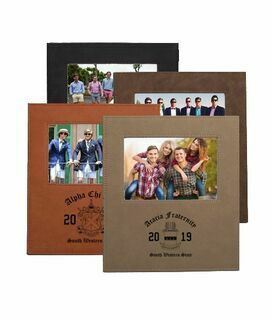 If you have multiple photos to display from your Greek life, consider our silvertone picture album. 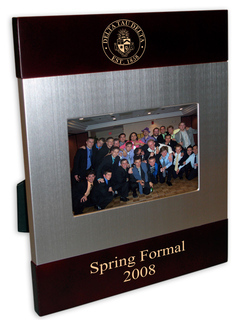 It's engraved with the fraternity or sorority letters and crest, and has 50 pages which can display up to 100 photos. 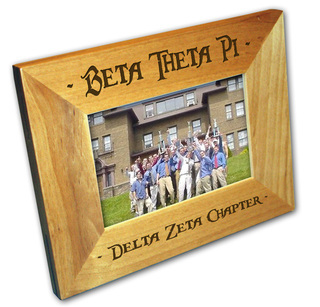 The Fraternity Crest Picture Frame includes an additional line of engraved text of your choosing, which can be the person's name. We also have Greek chest treasure boxes with a frame to hold a cherished photograph. There are two styles available - with a single line of custom engraved text, or with the group's crest and optional line of personalization. These make beautiful gifts for special occasions, and are perfect for holding personal mementos of one's Greek family. Picture FramesThe Greatest Selection. Period.